Each year our community comes together to celebrate the musical tradition, dance, and culture of flamenco. 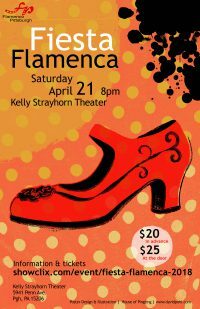 The beauty and intricacy of the rhythms, the aesthetics of the dance, and the warmth of our community keeps attracting a very diverse group of people who meet at the Kelly Strayhorn Theater to share and join in our Fiesta Flamenca. Tickets for this event are handled by Flamenco Pittsburgh. For questions and concerns please contact Carolina Loyola-Garcia.